This past weekend Stella was playing in the yard while Jeff mowed the grass. 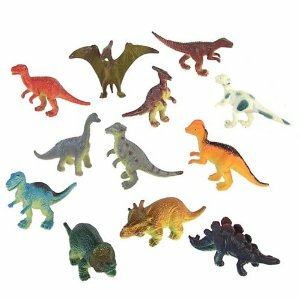 When she came back into the house, she showed me three tiny plastic dinosaurs she had dug up. Our guess is that the little girl who lived in the house before us buried them. Isn't that just a child's dream come true? To find buried treasure! Jeff told me she had found 1 dinosaur in that spot before so she continued her archaeological dig to find more. So that the fun continues, we are going to buy and bury more, a few at a time. If you have a patch of dirt that you can spare for a dig, this is so much fun for the kids! Love this idea Tiffany. Can someone come "plant" jewelry in my garden? great idea...can't wait to do this with my girls! so sweet, tiffany. when we're at the beach, mine will spend hours hunting and digging for sea glas. i've often thought of buying some manufactured sea glass at the craft store and 'seeding' the beach.